This section consists of random island tips plus a few cultural considerations. 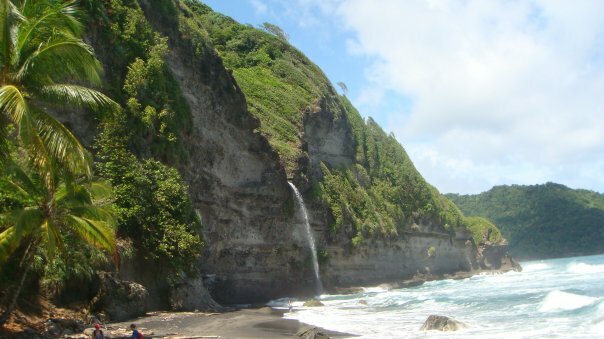 If you love the outdoors, then Dominica is the place for you! There is so much exploring to do. From the ocean to the rivers, to hiking and waterfalls, there is something for everyone. Click here to get an idea of fun things to do around the island. Your first few weeks on the island may be exhilarating or they may be tough. Embrace the experience for what it is. For some, you may be leaving home for the first time, or maybe it is your first time outside of the US, or your first immersion into another culture. Adjustment is a completely individual experience. We all come from different walks of life and will adjust on our own time line. All of your Ross family has either been there or going through it with you so know that you are not alone. Get to know the locals. Typically, Dominicans are friendly and enjoy instructing visitors on what to see in Dominica, how to prepare local dishes etc. Begging is illegal. The government asks that you not give money to beggars. The Dominican version of hello is “good day” or “ok”. In the evening instead of saying “good day” they will greet you by saying “good night”. English is the predominant language spoken in Dominica but keep it mind that it will seem like the locals are speaking very fast and or have an accent. Get used to saying, “I’m sorry can you repeat that?”. When you hear two locals talking it may seem by their tone that they are upset with each other. Usually that is not the case, they are just a passionate, expressive people. This is how they communicate…unless it’s an election year, then you may hear a bit of shouting 🙂 . The local livestock/pets roam. They may roam into your back yard, on campus, or just park themselves in the middle of the road. This is the “nature isle” at it’s best. If you are on a tight budget, consider letting go of buying American name brands. American goods are more expensive here because they are imported. For example, a box of Cheerios will cost you at least 7.00 USD. Save some cash by supporting the local community and buying their brands. Some people ship barrels of food here because they need/want certain things or they feel it is more cost effective in the long run. I’ve never done that. Eggs are not always refrigerated here because the chicken just laid them this morning. It’s ok. If you are concerned an egg is not fresh try the float test. Fresh cow’s milk is not widely available. You can find it at IGA Portsmouth, Tina’s Grocery in Glanvilla and Save-A-Lot in Roseau. Most milk here is shelf milk or powdered milk. Almond milk, soy milk and goat milk are available. “Island Time”-the overall pace of life is slower here and if you try to force things to move at the pace you are used to, you may find yourself very frustrated. Due to all the mountains and curves of the island, the drivers honk their horns a lot to let other drivers/people know that they are coming around the other side of a bend. Shortages. The island will go through shortages of different goods or products. Maybe they are out of propane gas, maybe eggs, lettuce, oatmeal, it could be anything. The coffee shop runs out of coffee and KFC runs out of chicken. It happens. Stock up on things you like. The local people bathe in their wonderfully beautiful rivers and in the Caribbean Sea. Not a bad thing, just something you may not be used to. Don’t be shocked. This is their home and their way of life. Dominica is a wonderful melting pot, home to people from all over the world. Some of the local people know more about US politics than we do. Take some time to get to know their culture. Try to learn some patois. Ross University is probably one of the most culturally diverse medical school around. Take some time to socialize outside of your comfort zone and try new things ! There are no poisonous snakes on the island. There are boa constrictors that hang out in the rain forest. The only creatures that can cause you some pain here is the centipede and the jellyfish. Stay away from the manchineel tree and don’t eat unripe ackee. It is common for people to walk the streets with a machete (cutlass) in their hand. This is one of their main tools used in farming/agriculture. There are two cures for homesickness: 1) get involved with a student group at Ross or in the local community or 2) get out and explore this gorgeous island ! Isolating yourself=depression. To communicate with loved ones back home try using programs like Skype, Magic Jack, Vonage, Facebook or FaceTime. Power outages. Power outages are part of life here. Outages are typically 2-4 hours. Outages occur not only during bad weather, but when the weather is beautiful as well. Some outages are scheduled by the power company, DOMLEC. With the frequent power outages/brown outs, it is easy for your lap top /TV/ appliances to get fried here. Use surge protectors. Keep things unplugged when not in use or during a storm with lightning. There are generators on campus of course but your home/apt. may not have one. Keep a supply of candles, matches, flashlights etc. Internet Service. Be advised that the internet goes down more often here than it does in the US. You can usually get a great signal on campus, but your apartment internet may not be as reliable depending upon where you live. Back up your valuable study materials on a jump drive, external drive, or online. Kitchen stoves/ovens run on propane tanks. Unlike propane tanks in the US, there is no way of knowing when your tank is getting low. You might be able tell by the decrease in the weight of the tank when lifting once you have been here for a while…but usually the flame just goes out. Refills are ~ 34 EC and can be obtained from Tina’s or James Store in the Picard area and the Texaco station in Portsmouth. You can send A-1 taxi to pick up a tank for you. Fees do apply. I recommend buying an extra propane tank. That way, if there is a propane shortage you won’t be stuck without being able to cook when your home tank runs out. The cost for an extra tank is 134 EC (100 EC deposit for the tank which you will get back when you return the tank with proof of purchase and 34 EC for the gas filling). I purchased mine from IGA Whitchurch grocery in Roseau. I think you can also buy them now at IGA Whitchurch Portsmouth. Keep all of your dried goods (beans, cereals, rice) either in the refrigerator or sealed in ziploc bags/tupperware. Got to keep the critters out. Cell phones and electricity are mostly on a pre-pay plan here. Instead of having a monthly bill, you will have a pay as you go plan. I have a whole tab on “Electricity” for more info. The two major cell phone companies here are Lime and Digicel. They both have specials the first week of school. Lime is located on campus. Simple cell phones are inexpensive. As in England, they drive on the left side of the road here…and very fast. Not a lot of street signs in Picard. You may hear things like…pass the coconut tree and turn left for directions. The locals will know where you live if you tell them the name of your landlord and or apartment bldg. There are not many jobs available for student spouses and/or their visa may keep them from being employed. Some spouses share their skills in the community for a nominal fee-baking, crafting, tutoring, personal training, spear fishing etc. Some people take classes online to keep busy. There are tons of volunteer opportunities (teaching, life skills training, youth outreach etc). Consider getting involved with the spouses support organization RSO. You will meet great people from all over the world. They will be your family for the next 18 months. Visit their website here . You can also find Ross Spouses Organization on Facebook under “Groups”. HI Britta! Regarding your Iphone question… I recently purchased an Iphone from another student because you can actually put the sim card from the cheap phones here and put it in the iphone and use it as a phone and you get free data package on it. So, if you are in an area with no wifi, you still would have internet. Its pretty cool because all you really have to pay, per month, is 50EC which is about $20US and you get an equivalent of what you normally pay over $100US in the states! But, if you didnt want to use the iphone for your phone and just wanted to use it for emails,skype, etc… you should still be able to use it in the wifi areas. My sprint phone, Evo, does that without any problems. First of all, can I just say that your blog is a Godsend! It is the most complete set of information about life at Ross that I have been able to find. I am coming to Ross in September and as you probably know, we med students (and future med students) pretty much have the next 10-15 years of our lives planned out in our heads. So, to be wondering about all of these little details that are going to be a part of my daily life in less than six months is pretty much driving me crazy. Thankfully, I have found a lot of the answers to my questions right here. Now about the iPhone thing…I have Verizon so I was happy to see what you had posted about them. However, (and excuse me for being a little bit technologically challenged) if I decide to just terminate my contract, does anyone know if the whole phone gets locked or just the “phone” part of my iPhone? For example, if I were in a wi-fi area, could I still use my email, Skype app, Google maps, iTunes store and all of that other good stuff? I was thinking I could just do that and get a cheap prepaid phone once I got to the island to make local calls in case of an emergency, but wasn’t sure if that would work (I of course have my computer, too for Skype and stuff but have grown quite attached to having these things on my phone). Can you keep your same number and is calling Dominica considered international? It looked like the same 10-digit numbers are used. I would think just taking out the iPhone’s SIM card and inserting one from the other companies would make it work fine? Or do you need to actually unlock the phone through some software? Our US phone numbers do not work here because our US carrier (verizon) does not offer service here in Dominica. You will have to call your carrier to find out if your US phone number will work here. We bought Dominica cell phones because they were so cheap-around 25 US a piece. Yes, even though you use 10 digit numbers to call Dominica it is considered an international to call from US to Dominica and vice versa. I see you are a gmail user. In case you don’t know, with gmail accounts note there is a “call phone” tab in the left lower corner of your inbox page . You can call the US that way. My iPhone works fine. We r not at Ross but own a home in toucari and visit regularly. I don’t own an iphone but I’ve heard people say that it only works if the phone is “unlocked”, whatever that means.